This lesson can be used as a pre-lesson for the Analyzing Visual Elements lesson plan. Students will be able to make connections between visual elements and the text. Students will be able to draw inferences from a text. 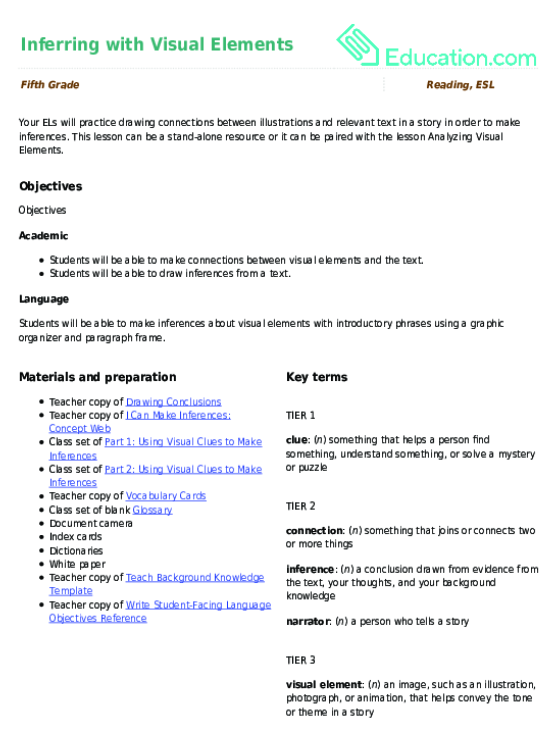 Students will be able to make inferences about visual elements with introductory phrases using a graphic organizer and paragraph frame. 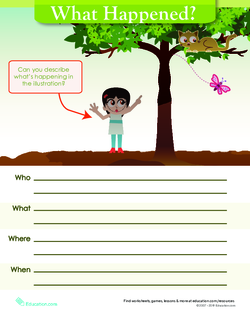 Show the picture from the Drawing Conclusions worksheet. 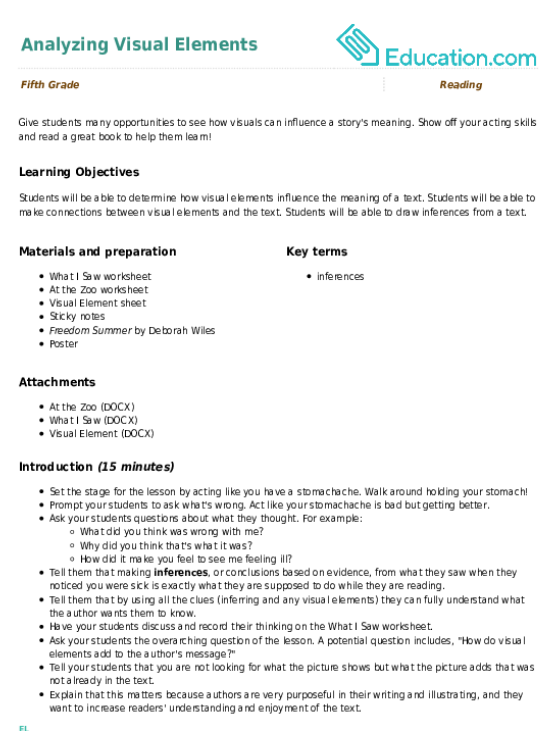 Then, inform students that just by looking at this picture, they can find clues about the 5 W's ("who," "what," "when," "where," "why"). Call on students to share their ideas about this scene. Tell students that in order to really know what's going on in this picture, they would need to read the part of the story that goes along with the picture. Tell them that today they're going to be using clues that they find from both the text and pictures in a story to make inferences about that story. Display the worksheet I Can Make Inferences: Concept Web in a highly visible place in your classroom and read the different parts of the web. 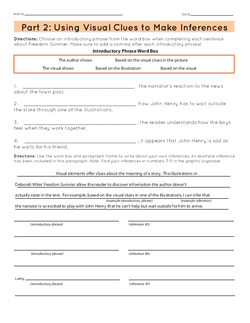 Tell your students that during this lesson, they'll be reading parts of the book Freedom Summer and using a graphic organizer and sentence frames to write inferences. Tell students that you'll be reviewing some key terms that they'll need to know before starting this lesson. Ask students to participate in a choral response as you read each of the following key terms: inference, clue, connection, visual element, narrator. 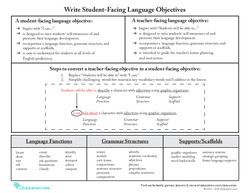 Review student-friendly definitions and an example sentence for each term and provide visuals when possible. 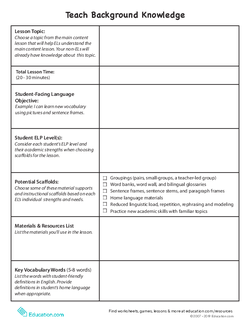 Distribute a class set of the Glossary worksheet, and ask students to record the student-friendly definition for each key term listed above. 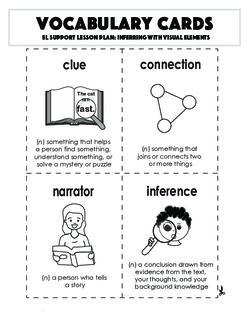 Remind students that they can refer to these definitions as needed throughout the lesson. Ask each partnership to write their names on the back of the index card and define their key term in their own words. Write the following sentence frame on the board for student reference: "The word _____ means _____." 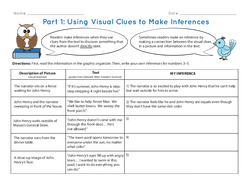 Display the worksheet Part 1: Using Visual Clues to Make Inferences and hand out one copy to each student. Read through the teaching tool at the top of the worksheet, as well as the information on the graphic organizer. Model which key terms (from the vocabulary activity) to underline as you read aloud. 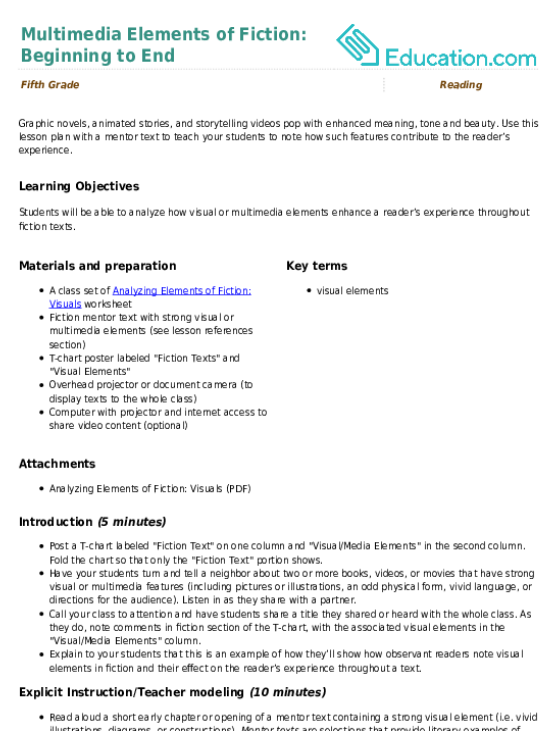 Refer to Deborah Wiles' picture book, Freedom Summer, to show students the visuals and text that were selected for the graphic organizer, providing enough context for students to make inferences. (Note: If you can allow more than the allotted time for this lesson, read the picture book aloud). Ask students to complete inference number 3 on the graphic organizer with their shoulder partner. Call on students to share their responses. Ask students to complete inference numbers 4 and 5 independently. Have students share their responses with their shoulder partner and allow time for partnerships to ask any clarifying questions. 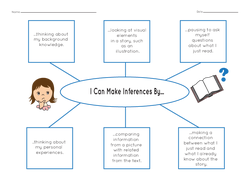 Explain that now that everyone has practiced making inferences, they'll practice writing inferences with specific introductory phrases. Ask students if they've ever used phrases such as "for instance" or "according to the author" when writing about their reading. Explain to students that these are introductory phrases. Display the worksheet Part 2: Using Visual Clues to Make Inferences on the document camera and read through the Introductory Phrase Word Box. Complete the first question as a class. Then, ask students to work with their shoulder partner to complete questions 2–4. Review answers and address any questions. Tell your students that they'll select from these introductory phrases as they write about their inferences. Remind your students that writers use introductory phrases and transition words such as, "I can infer that ____," to help make their words flow together more smoothly. Read the first part of the paragraph and have students draw a star next to the phrases "for example," "based on the visual clues," and "I can infer that." Inform students that these phrases give this paragraph a clear structure. 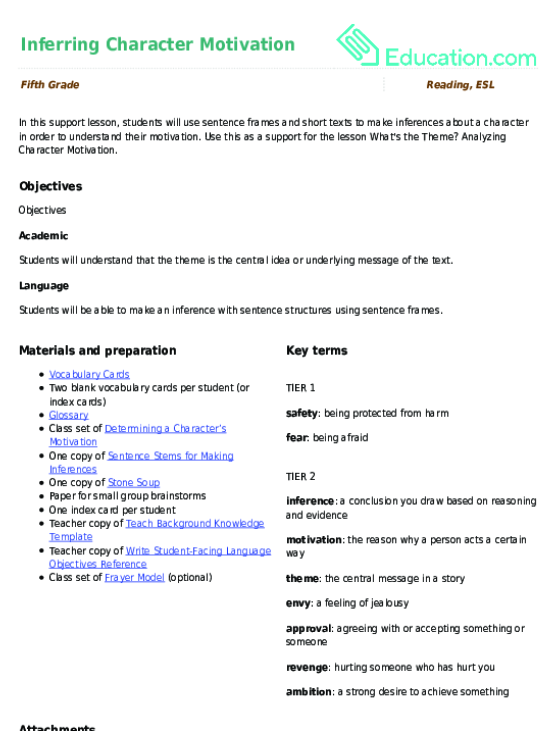 Point out the spaces for the introductory phrases and inferences within the paragraph frame and ask students to complete their paragraph, while referring to their inferences on the graphic organizer in Part 1 of the worksheet. Define key vocabulary terms essential to the story during the read-aloud. 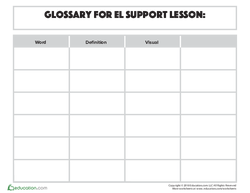 Allow beginning ELs to work with sympathetic and helpful intermediate or advanced ELs during independent work. Ask students to share their sentences and paragraphs first to the group. Pair beginning and advanced students with the same L1 and allow them to speak in their L1 while discussing the text. Display the image from the Drawing Conclusions worksheet and tell your students that they will be writing an inference about this picture using the sentence frame format from Part 2: Using Visual Clues to Make Inferences. Hand out an index card to each student, and have them write their inference and remind students to include an introductory phrase. Read the following inference slowly: "Based on the illustration, I infer that this situation happened in the springtime." Ask your students to clap once if they think this inference has an introductory phrase. Point out the introductory phrase in the sentence. Review the concept that authors use visual elements as one way to inform their readers about the meaning of their story, without directly stating certain information. Visual clues tied to information within the text allow readers to draw strong inferences. Graphic novels, animated stories, and storytelling videos pop with enhanced meaning, tone and beauty.